EUGENE, Oregon — Can’t get enough of the NCAA Division I Outdoor Track & Field Championships? 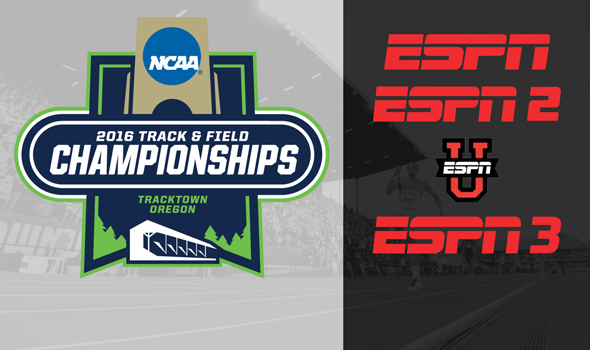 From start to finish, the entire meet will be broadcast live across the ESPN platforms – from the combined events and field events starting Wednesday afternoon online via ESPN3 all the way through the live national ESPN broadcasts of Friday’s men’s finals and Saturday’s women’s finals. RETWEET if you're excited for the #ncaaTF Championships on @espn starting TODAY! Beginning on Wednesday, June 8, the action gets underway on ESPN3 at 3:30 p.m. ET with the start of the men’s decathlon. ESPN3 will be the hub of all combined events and field events throughout the championships and will broadcast all day. Then at 7:30 p.m. ET, ESPNU will join the fun until ESPN2 takes over at 8:30 p.m. until the conclusion of Day 1. Thursday’s broadcast on ESPN3 starts at 1:30 p.m. ET with the start of the second day of the men’s decathlon. Once again, you can keep ESPN3 on to follow along with the decathlon as well as the field events. ESPNU will show the meet from 7:30-8 p.m. until the action switches over to ESPN from 8-10:30 p.m. ET. On Friday, the heptathlon kicks things off at 3:30 p.m. ET on ESPN3 and that channel will be live until 11 p.m.
ESPN is going to air the men’s finals beginning at 8 p.m. ET until the 4×400 wraps things up three hours later. ESPN3 goes live on Saturday at 2:30 p.m. ET and will continue until the conclusion of the meet. Women’s finals will be aired on ESPN starting at 6:30 p.m. until the end of the 4×400. Check out the schedule below for the full rundown of field event and combined-event action online at WatchESPN.com/ESPN3.